This is the last of my entries for my Kaohsiung trip in March. I will start writing about my Europe trip in my next entry. Stay tune! Planned to take normal train back to Taipei, but found out that long distance coaches are much cheaper, actually almost 50% cheaper! 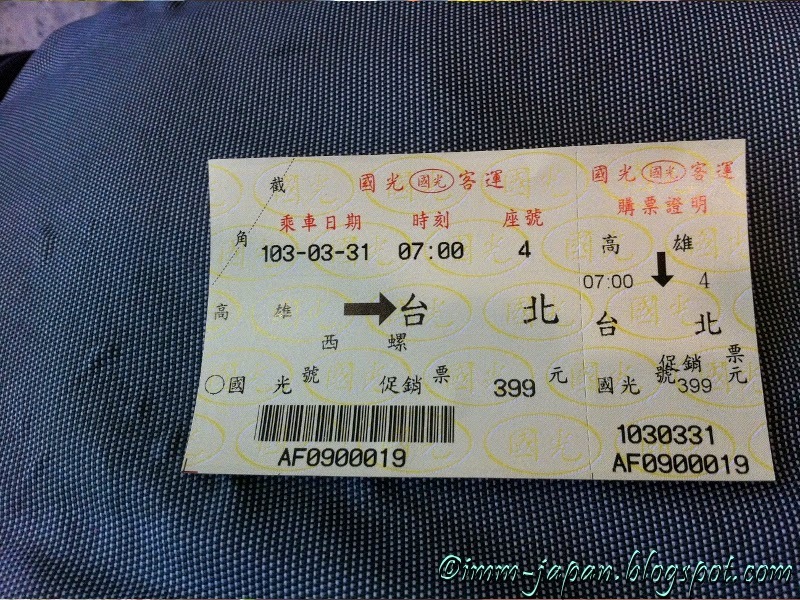 Train fare from Kaohsiung to Taipei costs NT$853 with no special discounts for students, while coaches for the same journey cost only NT$399! So for the sake of my wallet, I took the bus instead.. One of the push factors for my taking the bus is that there are more than 3 bus companies near my hotel. It was very convenient. The seats are similar to those in Malaysia, with the 2+1 configuration. Since I didn't know to ask for a single seat, I was seated with an elderly gentleman just behind the driver. So my hope of seeing the sights kinda evaporated as I was sitting in the aisle seat. After departing from the main terminal, the bus stopped a couple of times within Kaohsiung area to pick up several more passengers before hitting the expressway heading north. It stopped once for about 10 minutes at a station, not on the expressway, so that we can use the toilet. Not too sure how fast the bus was traveling, but I think it was within the allowed speed limit as it was on the 2nd lane all the time instead of the 1st lane like most coaches in M'sia.